Williams, 53, cleaner, was charged with causing the death of Anthony âBrassyâ Nero, 52, of the same address, on August 23, 2011. She was not required to plea to the indictable charge and the matter was adjourned for Preliminary Inquiry on January 20, 2012. Scores of angry persons, who gathered outside the court, mobbed the police transport, in which Williams was seated. 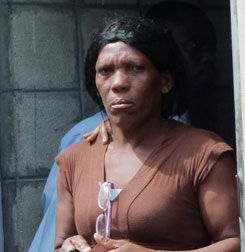 On Tuesday, September 13, Neroâs decomposing body was found in a sewage hole in the yard of the house where Stefforn Williams lives at Redemption Sharpes.